Johnny Football is bound for the Hammer. Former Heisman Trophy winner Johnny Manziel on Saturday announced on Twitter he has agreed to a deal with the Canadian Football League's Hamilton Tiger-Cats. Manziel joins the team on a two-year deal. "I don't want to wait around anymore," Manziel said during a news conference at Tim Hortons Field. "I want a chance to get on the field and get into the locker room and get a chance to play ball again. "This isn't just a pit stop for me. I'm not coming here to get what I need to go back down to the NFL. I've signed into this for the long haul, for two years. I'm here to make the most of it." The Ticats didn't divulge details of Manziel's contract but it reportedly includes a $122,000 base salary with a $10,000 sign bonus and $18,000 housing stipend. Manziel is also said to receive $10,000 bonuses for being active six, 10 and 14 games as well as $120,000 bonus if he plays in half of the club's snaps. There's also reportedly a $75,000 off-season bonus due March 1. Manziel's '18 base salary would increase to $202,000 with the same incentives. "I don't know what two years down the road looks like for me," Manziel said. "Maybe I come up here and I love it and I don't want to go anywhere. "We'll play it by ear and take it day by day like I've been doing." In January, after signing a three-year contract to remain as Hamilton's head coach, June Jones boldly gushed about Manziel's potential. Hamilton (6-12) finished third in the East Division last year and missed the CFL playoffs. The Ticats were 0-8 with quarterback Zach Collaros before Kent Austin resigned as head coach and was replaced on an interim basis by Jones. A return to the National Football League was the former Cleveland Browns quarterback's top priority in March. "If something pops up, it pops up," the 25-year-old Manziel told reporters at the time after throwing at Texas A&M's pro day. "If not and I don't get the opportunity to go back [to NFL] I'm going to go play in the CFL and things are going to be fine. "One way or another, one day down the line I'll get back to exactly where I want to be because I'm not going to stop until I do." The Tiger-Cats, who owned Manziel's CFL rights, previously made a contract offer to the pivot's agent, Erik Burkhardt, but the two sides couldn't reach an agreement. The Ticats also have starter Jeremiah Masoli along with Vernon Adams Jr., Dane Evans and Bryant Moniz under contract. The Ticats signed Masoli — who went 6-4 after being named Hamilton's starter by Jones — and receiver Brandon Banks to contract extensions in January. Manziel drew a crowd at College Station, Tex., on that March day as all 32 NFL teams and two from the CFL (Saskatchewan and Montreal) attended the workout. ​He also threw at the University of San Diego's workout before scouts representing 13 NFL teams. Manziel starred at Texas A&M, capturing the 2012 Heisman Trophy as U.S. college football's top player. He was selected in the first round, No. 22 overall, in the 2014 NFL draft by the Browns. But the Browns released Manziel in March 2016 after he posted a 2-6 record over two tumultuous seasons. Manziel has been out of football since. Manziel also had public off-field issues. In April 2016 a former girlfriend accused him of assault, and the misdemeanour assault charge was dropped after Manziel attended an anger management course, a domestic violence victim panel and substance abuse program. Manziel has also divulged he's been diagnosed with bipolar disorder that he takes medication for and candidly discussed his alcohol use while he had depression. "I feel like I'm different, I feel like I'm doing really well," he said. "I feel like from a mental standpoint I've figured out what benefits me the most and what helps me. "I can sit here and say that all day but until I really get the opportunity and go in and show it day in and day out and keep this consistent run of good behaviour, of good health going then it's all for naught if I don't. But I'm confident that I will. I'm preaching to myself, 'Consistency, consistency,' every day." 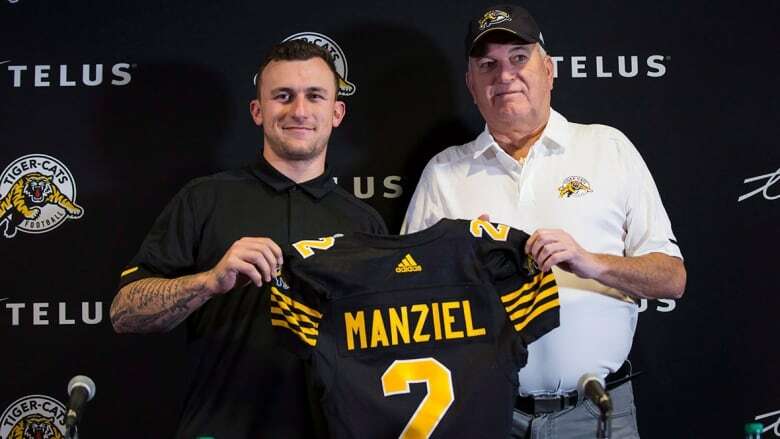 In December, 2017, the Canadian Football League issued a statement which said it had been engaged in a thorough process to determine the eligibility of Johnny Manziel, whose CFL rights were and are held by the Hamilton Tiger-Cats. That process included an assessment by an independent expert on domestic violence (the CFL has a formal policy on violence against women), a review by legal counsel, and an in-person discussion conducted by the Commissioner. Recently, the league was informed that Mr. Manziel and the Tiger-Cats were close to reaching an agreement. Subsequent inquiry confirmed Mr. Manziel has been meeting the league's conditions. The league then advised him and the Tiger-Cats it would approve and register a contract for Mr. Manziel, who has also been informed that he must continue to meet these conditions to maintain his eligibility. As is the case with all of our players reporting to training camps this weekend, we wish him and his team the best of luck as they prepare for the upcoming CFL season. Should the CFL give Johnny Manziel a second chance?